"You guys forgot to tie up your boat and it drifted away"
"Good thing we own a shipyard now." This was Dave's his first real game of D&D as the Dungeon Master, and he handled it well! One of the things that really added to the immersion, was that Dave had purchased a D&D 4 tile set which he can use to create cities, and one to create wooded areas. This really added a great level to the role play, as the space was clearly defined! Only Jeff and I were able to make it to this game, and though sorrily under powered we managed to muddle our way through a couple events and even managed to "conquer" our first area. In Game 1, Dwannis Muck-Mug left heading towards the tavern, and Dave began this tale with me sitting in the establishment. Jeff's Character Raskavas, a Drow Fighter, was also looking for breakfast in the Tavern, but they didn't exactly meet there. Dwannis was sitting at a table, his unwashed scent was really stinking up the place, what with him living in a garbage heap and all. People had started to complain to management, and just before the waitress was about to kick him out, he bribed her with 4 gold for a bucket of slop out back. A little disgusted she pocketed the change and escorted him towards the garbage. Dwannis was hungry. As Dwannis headed out back, he walked right by Raskavas without seeing him. Raskavas, was a newcomer to the town. For years he had been searching for his missing daughter, and his travels had brought him to the small town of Bellwick. He was looking for a place to stay while he searched the slums, and had come across this tavern. Being a Drow, the owner was unwilling to give Raskavas a room, but would let him have a meal if he could pay. Raskavas was very upset by the rude treatment and decided to enact some retribution. He asked the waitress how hot their soup was, telling her he wanted it "almost scalding." His intention was to throw it in the face of the tavern owner, but the waitress got wise and chased him out. As Raskavas darted from the Tavern, he bumped into Dwannis who was just coming around the corner after finishing his slop. the two fell in a heap to ground, and so they met for the first time. Raskavas yelled at Dwannis, insulting his stature, his birth and his pungent aroma. But rather then being insulted, Dwannis saw the big picture, and realized that a stout Drow fighter would be an asset in his quest to find out who was poisoning the Drow and Duergar. The only one problem was that, his charisma was 5, so Dave has made him roll every time he tries to convince someone of something. Dwannis rolled terribly, and Raskavas just stared blankly at him in disgust. Decided to try a different approach, Dwannis thought to impress Raskavas by putting him to sleep with his magic. It worked, but when Raskavas woke up, he was very angry. It almost came to a fight, but Raskavas realized that Dwannis was a powerful being, and that he didn't seem to want to hurt him, Raskavas decided to follow Dwannis at least for the time being. Perhaps in the Future Dwannis would help him find his daughter. Just as they were about to leave the front of the Tavern and go investigate the poisonous pork products, some townsfolk came running into the market yelling how a boat had scuttled on the rocks off the shore. Thinking this important, they decided to investigate, stocking up on a few Cure Light Wounds potions before they went. The two headed over to the docks to see what they could learn of the crashed vessel. The gossip on the wharf was that it was a Light Cargo Ship that had crashed on the rocks, and rumour was that it was full of gold, others said strange creatures lurked on those rocks. Seeing an opportunity on the waves, Raskavas and Dwannis ask around, trying to find where they could get a boat. A guard directed them to Frunner's Fisherman's Supplies, a small outpost outside of town where local fisherman buy their small boats, nets etc. 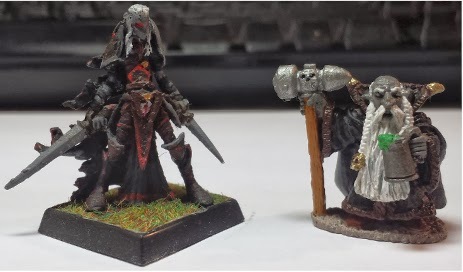 Frunner's would have what they needed, but the guard also warned them that the owner, Holace Frunner, was known for his dislike of Drow and Duergar. Raskavas and Dwannis agreed that they would get a boat from Frunner's come hell or high water. Feeling peckish, before they left, they grabbed some fried fish from a stall to eat along the way. Then fish in hand, they headed along the beach leading out of town and towards Frunner's. From Bellwick to Frunner's by way of the beach was a two hour trip. The first half of their journey was uneventful. But as they reached the second half, three guards who were patrolling the beach stopped to question them. The Guards were acting suspicious towards Dwannis and Raskavas and were a little rough, but they probably would have let them pass, if it hadn't been for Raskavas. He decided to try to lie them. This may have worked, but rather then saying we were going to Frunner's to get supplies or something simple, he starting spinning tales about being Guards ourselves, or how they on their way to visit sick family and so on and so on. He spun one different story after another never sticking to the same lie. The guard didn't believe a word of it and were about to arrest them, until Raskavas Drew his sword. The Fight was sloppy, as Dwannis and Raskavas rolled very low. The fight seemed to go on forever. Dwannis and Raskavas manged to subdue their foes and left the scene as quickly as they could. They arrived at Frunner's an hour alter, finding it to be a small shack sitting in a field just meters from the beach. A few small row boats, fishing nets, and several barrels and boxes sat around the property, creating the illusion of a store front, but it was a disorganized place. Dwannis and Raskavas entered the shack finding Holace and his two sons Gallan and Reen working inside. Raskavas and Dwannis were ready to get kicked off the property, but instead Holace and his sons were very friendly, and very accommodating. Perhaps the rumours about him were untrue. Regardless, it would be their last mistake. Raskavas claimed that they were looking to become fisherman, and needed supplies. Holace Frunner was willing to sell him a boat and any equipment they need, claiming to appreciate seeing some of their kind so hard working. He Took then took them outside and showed them his finest row boat, only 50gp. Dwannis had no intention of buying a boat, and quietly he prepared the spell Shocking Grasp. But Reen heard him mumble the words, and things quickly went south as swords were drawn. Dwannis quickly cast his spell on Holace, killing him in one blow. But Raskavas was fighting with Gallan and Reen,who proved to be the tougher opponents. Even when Dwannis moved in with his hammer. After getting no where with the fight, Dwannis stepped behind Reen and blinded him with a Blindness Spell. Disoriented, he cried out, distracting his brother Gallan for a split second. Raskavas , being a keen fighter, used the moment to run his blade through Gallan's gut ending his life. Raskavas and Dwannis both stepped back from Reen as he lashed wildly about with his sword. They then pushed him over and gave him a thorough beating, leaving him with 0 hp, and blind. Dwannis prepared the row boat Frunner had showed them, and loaded it with some rope the oars. Dwannis also grabbed Holace's body in the event they needed a decoy. With the supplies ready, they set out towards the Shipwreck. As soon as Dwannis and Raskavas got the boat out on the water, things went poorly. A strong wave, and their incompetence beached the boat more then once, but not discouraged, they continued until they got their sea legs. All was going well until they drifted a little to close to the Bellwick Docks. Two Elven Guards who were standing watch as the sun setting noticed the little boat, as Raskavas and Dwannis got as low as they could. To throw them off, Dwannis sat up the body of Holace. Form that distance it fooled the guards, though Dave told us that they thought it odd that Holace was out so late. When Raskavas and Dwannis reached the shipwreck, they clearly saw a man's arm hanging over the side. Figuring that the town guard had already arrived, Dwannis cast a spell to try to pull him down, but only the arm fell over the side with nothing else attached. Something strange had happened here. Raskavas and Dwannis decided to be more cautious, slowly circling the ship looking for a way on board. They found a large hole in the side of the ship and peered inside. Three Nagas had gotten on board, and were guarding a horde of cargo. Knowing there was no way for the two of Them to defeat three Nagas, they had to come up with a better plan. First, they tried to dangle Holace Frunner's body on a oar in front of the hole, in an attempt to coax them out. Angered by this, the Nagas quickly snatched Holace's body bring him inside. Not exactly what they had in mind, but still a hilarious sight to see. The second plan was for Raskavas to go above deck and create a noise. Dwannis would then wait by the treasure and run in and grab some when the Naga left to investigate. It seemed sound, so Raskavas jumped on to the rocky shoal and almost fell into the water. Dwannis I managed to save him by throwing him a rope which he used to climbed up to the top deck. There he started banging on things with his sword and creating a great racket. The Nagas left the hold and Dwannis ran in. He only had time to grab a small chest before the Naga's got wise both he and Raskavas had to run for it. Raskavas Leaped form the deck into the small boat and we headed back to Frunner's with our pitiful plunder. Angered, Dwannis vowed he would get Holace's body back from the Nagas no matter what it took. After returning to Frunner's, Raskavas and Dwannis smashed open the chest. In It they found a few gold pieces, and a new hammer for Dwannis! Deciding to make camp at Frunner's permanently, Dwannis suggest that they hide Galan's body and then find the deed for Frunner's. Perhaps they could cheat thier way into owning the place.Raskavas agreed and tied Galan's corpse to a heavy stone. He dragged him out onto the small dock and dropped him in the sea. Dwannis searched the shack for the deed, while Raskavas dealt with Galan. But after turning the place upside and finding only a small locked a safe he was getting frustrated. Dwannis figured the deed must be inside but there was no sign of a combination anywhere! So, seeing it as the only choice, using a small vile of acid he kept with him, Dwannis burned the lock off the safe. it worked, but in his haste the acid also damaged the deed. Now they would need to figure out how to get a forgery. After complaining about the damaged deed, Raskavas remembered that he had left Reen behind, and though he was blind, he knew what happened here. Raskavas searched outside a bit, only to find he was missing. Deciding it futile to hunt for him in the darkness Raskavas and Dwannis slept, they would look for him come the next morning. The following morning Raskavas and Dwannis agreed to first hunt down and dispose of Reen. Second, find a cleric to heal their wounds. Third get a forgery of the deed made. To get the day started, Dwannis studied his spells while Raskavas went fishing for something to eat. As they left the shack, they noticed that their fishing ship had floated away in the night, they had forgotten to tie it up. The loss of such a nice boat was a shame, but it was a lesson well learned. And that was where the quote of the evening came from. Dwannis and Raskavas set off into the forest around Frunner's in search of Reen. After a few hours searching, they found him about half way between his home and Bellwick, stumbling across a shallow river. To remove any trace of the man, Dwannis hit him with a fireball, creating a loud boom and turning the poor fellow to ash. However the noise and the flash of light attracted the attention of several guards that were passing on the nearby road, and Raskavas and Dwannis where in no condition to put up a fight for long. The guards came rushing to the clearing, but Dwannis and Raskavas had hidden in the woods. Well that was the intention, but Dwannis wasn't very good at hiding and the gaurds spotted him almost immediately. Before they are able to do anything though Dwannis cast a Fireball at them killing the three of them where they stood. Raskavas was so impressed by this display that he swore allegiance to Dwannis then and there saying he would follow him where he went. Dwannis was pleased by this show of loyalty, and the two of the left the river side and headed towards Bellwick in search of a Cleric and a Forger. They made their way to the slums, where Raskavas saw first hand how sick everyone was. Dwannis tried to explain to him that they were being poisoned by rotting pork products, but Raskavas couldn't understand him. The church tent in the slums was a small and dirty place, but the Priestess there was willing to heal Dwannis and Raskavas' wounds. She called for Dwannis to step forward. For some reason, this really bother Raskavas who demanded that he be healed first. The Priestess refused, and he threatened her, in the end she did what he said healing Raskavas first and then Dwannis. After the encounter, she then demanded that they both leave and not return. An encounter with a potentially powerful and influential ally was just blown by a cocky fighter. And it would take us a long time to recover. After searching the slums for some time, Dwannis and Raskavas then found themselves a Drow claiming to be a skilled forger. He agreed to create a recreation of the deed, and would have it ready the following day. Pleased with the arrangement, Raskavas and Dwannis decides to go back to the tavern to grab lunch. And that is where we left it for the evening. All in all Jeff and I did pretty well. But we could really benefit from was another player or two. Basically, we needed a Bard, a Cleric, and Rogue. Elijah will fill the roll of the bard next week. I hope to go back to the shipwreck and investigate the pig farm next time. this should help us take over the town.